How did I make it this far into adulthood without bike camping? Well, it always seemed like too much work to figure out all the logistics. Yet somehow I have been getting influenced by the growing subculture of bikepackers here in Seattle. Maybe it’s all the photos I see of Bikeworks youth rides to the San Juan Islands…or the slick Instagram feeds of Swift Industries and Compass Tires. But one thing is clear: I am getting the urge to at least try an overnight trip on my bike within 15 miles of home. Little by little I am chipping away at the problem. First, how much stuff will I need? Second, how much am I able to carry on my bike? Third, how can I convince my amorous associate to try this? Can I convince her to go by offering to carry almost everything for two people? After a bit of online research, we had a plan. We could take a 45 minute ferry from Fauntleroy (just a ten minute roll from home) and ride a short way to Manchester State Park on the Kitsap Peninsula. The park offers 35 campsites, with water, showers and beach access. We could take a nice 7 mile ride here, scout it out for camping, and have a snack break. Then, we could ride another 6 miles into Port Orchard for a lunch break. Here’s the route on Ride with GPS. I bought a front rack for my bike. I needed to get this special one from Minoura which attaches to the front axle and cantilever brake bolts, since my bike doesn’t have mid-fork eyelets. Stuffing my four Ortlieb panniers full of hypothetical camping stuff was pretty fun. Even though we didn’t have a tent or sleeping bag in there, I managed to throw a sufficient amount of clothes in there to simulate the weight and volume of what we’d eventually bring. How did this extra weight affect the handling of the bike? Not much. 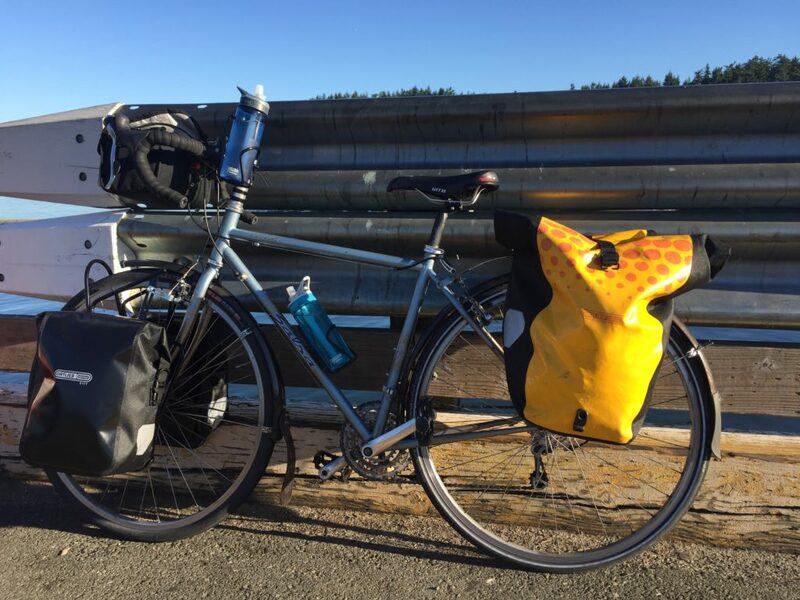 Since it’s almost all downhill to the Fauntleroy ferry dock, my biggest concern was the effectiveness of my brakes to stop me, since I had so much more momentum than usual. Still, all things considered, my entire setup was probably no heavier than the average man riding a bike. Score! After a quick ferry ride to Southworth, we were ready to hit the Kitsap. The crew and I had a simple cue sheet to follow, but it was pretty obvious where to go, since we’d be riding along the coast the most of the way. The roads consisted of rollers mostly, and because of the extra weight, I was in the small chainring (26 teeth) for most of the uphill portions. Having a sub 1:1 gear ratio paid dividends here. It took less than an hour to get to Manchester. 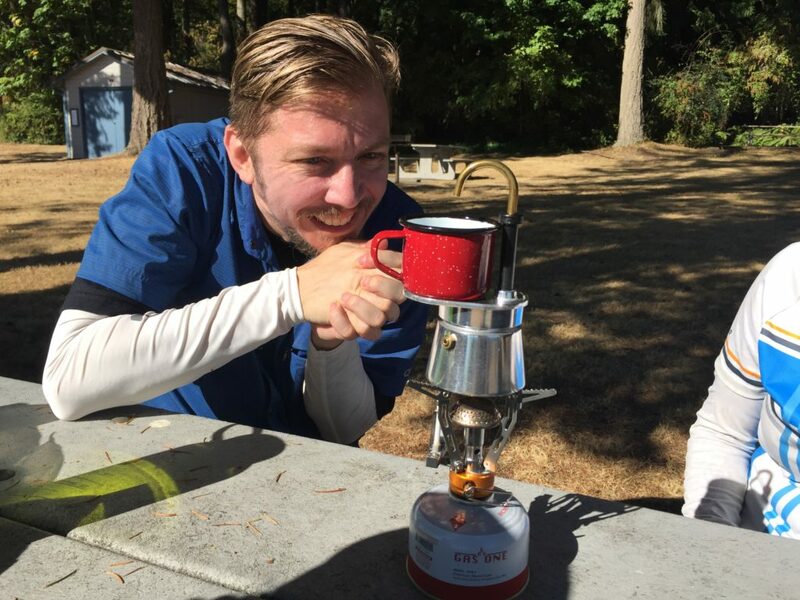 Upon entry, we scouted out some of the campsites, and then headed toward the water to have our snack and figure out Brian’s portable espresso maker. As far as beaches go, this one was not very appealing. It had big rocks covered by seaweed and didn’t smell too great. So we opted to spend our break under the fir trees by the big official looking building and picnic tables. 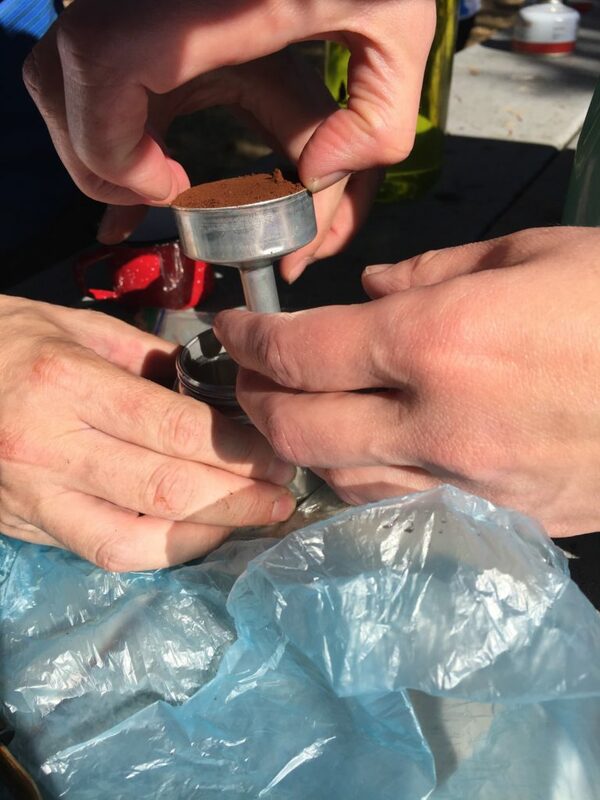 The espresso maker took three tries to get correct. 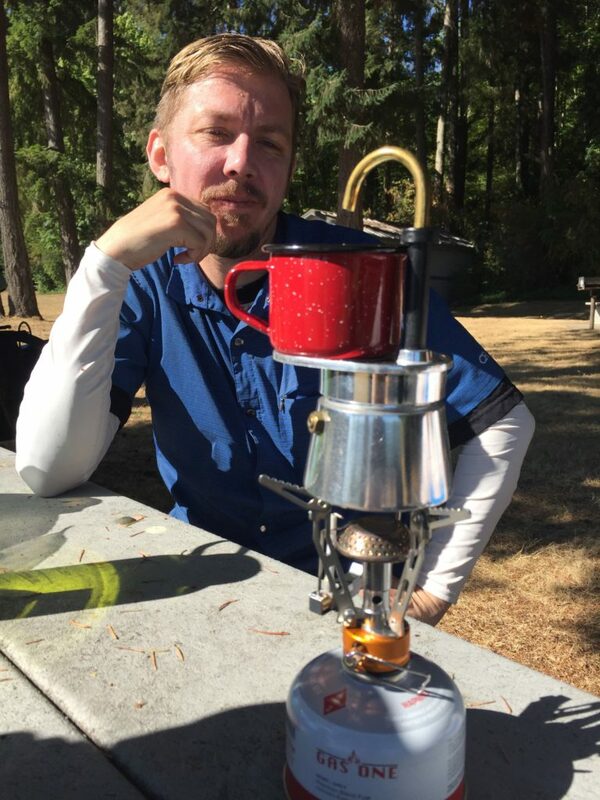 We heated it on top of our new mini camp stove, a Stansport model we picked up at Big 5 the day before. It uses 4oz propane canisters. During our future camping trip, this stove could be used for boiling water and making meals with said boiling water. 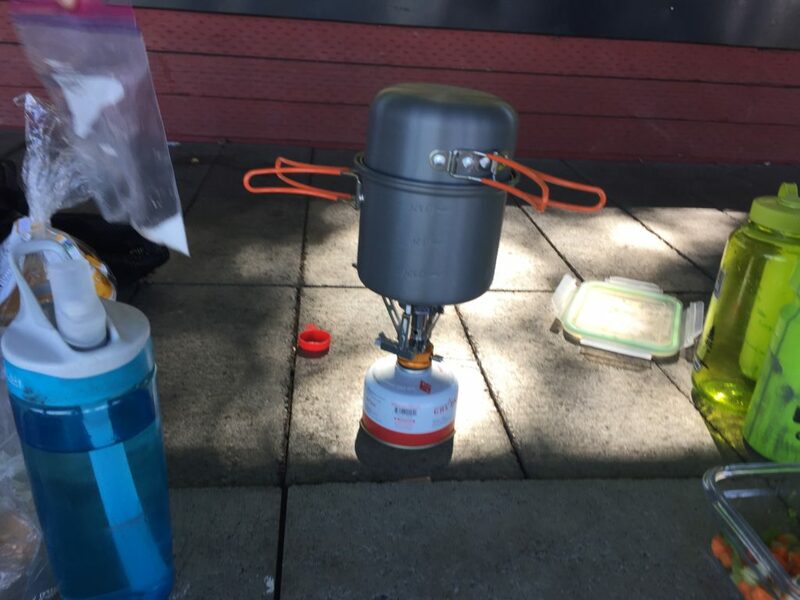 It’s not robust enough to handle cooking an entire meal like a regular camp stove. The great thing about it is its light weight compactness. After our break, we headed to Port Orchard where we were pleasantly surprised by a lovely Farmer’s Market. 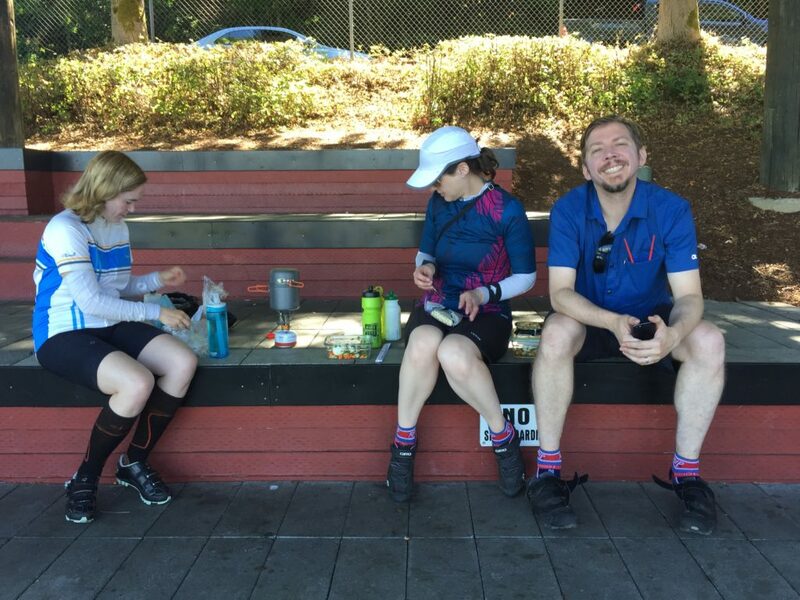 The Port Orchard detour would be an extra 12 miles on the day’s mileage, so I was definitely feeling it in my legs when we began the return to Southworth. The most difficult part turned out to be the ride back home from the Fauntleroy ferry, since it was in the mid 80s and my legs were exhausted from carrying all the extra weight. 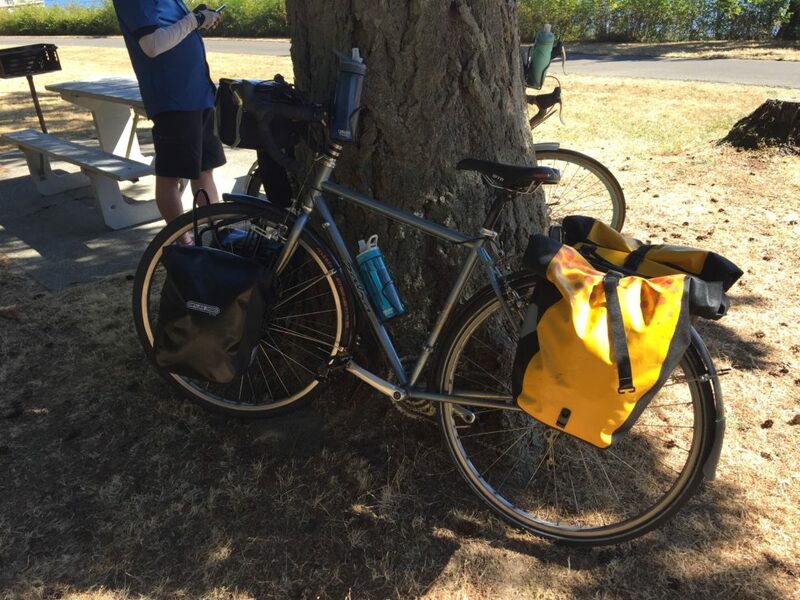 I expect that when we do the real camping trip, the whole thing will be so much easier because the riding will be spread out over two days, it will be cooler, and there will be less distance because we’ll skip the Port Orchard leg. My top goal for the next few weeks is to find a lightweight tent and sleeping bag.